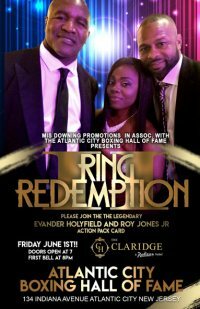 Atlantic City, New Jersey (May 16, 2018)--Rising super middleweight contender Derrick Webster will headline a great night of boxing on Friday, June 1st at The Claridge Hotel when he takes tough veteran Oscar Riojas in a ten-round bout for the ABF Super Middleweight Title in the main event of a nine bout card. The show, which will coincide with The Atlantic City Boxing Hall of Fame weekend, is promoted by Mis Downing Promotions. Webster of Glassboro, New Jersey has a record of 25-1 with 13 knockouts. The 35 year-old is a nine-year veteran, and is riding a six-bout winning streak. Webster, who has wins over Frankie Fillipone (22-5-1), Thomas Awimbono (25-5-1), Obodai Sai (23-1), is coming off an eight-round unanimous decision over Francisco Cordero (38-9) on February 10th in Philadelphia. This will be Webster's 5th bout in Atlantic City. Riojas of Monterrey, Mexico has a record of 16-9-1 with five knockouts. The 34 year-old Riojas is a five year professional who won his first 11 bouts. Riojas has been in the ring with title challengers Ronald Gavril, Vyacheslav Shabranskyy as well as undefeated fighters Conrad Cummings, Immanuwel Aleem, Francy Ntetu, Enrique Collazo & Ronald Ellis. Riojas is coming off dropping an eight-round unanimous decision to Brandon Robinson on April 6th in Philadelphia. In the special co-feature bout, Isiah Seldon of Atlantic City will take on Lamar Harris in a middleweight bout scheduled for six-rounds. The bout will kick off an historic weekend for Seldon, as his father, the former WBA Heavyweight champion of the world Bruce Seldon will be inducted into the Atlantic City Boxing Hall of Fame. The 29 year-old Seldon has a record of 11-1-1 with four knockouts. The eight-year professional is unbeaten in his last five bouts. In his last bout, Seldon got a disputed draw against Rudy Lozano on February 11th in Humble, Texas. Harris of St. Louis, Missouri has a record of 9-14-4 with five knockouts. The 33 year-old is a 13 year-professional who has faced top opposition who has a win over undefeated Earl Walker (7-0). Harris has also shared the ring with 12 undefeated fighters, which includes former world champion Shawn Porter and former world title challenger Matt Korobov. Harris is coming off being stopped in 2 rounds by Webster on August 5, 2017 in Atlantic City. In an eight-round bout, Prince Badi Ajamu (28-4-1, 15 KOs) of Camden, NJ will rematch Edgar Perez (7-24, 3 KOs) of Chicago in a cruiserweight bout. In a six-round bout: Kevin Asmat (3-2, 2 KOs) of North Bergen, NJ takes on an opponent to be named in a featherweight bout. Isaiah Hart of Atlantic City, NJ will make his pro debut against against an opponent to be announced in a middleweight bout. James Wilkins (3-0, 3 KOs) of Brooklyn, NY will battle Joe Gbolo (3-2-2, 1 KO) of Newbergh, NY in a featherweight bout. Also appearing in four-round bouts against yet to be named opponents are featherweight Vidal Rivera (7-0, 4 KOs) of Camden, NJ; super flyweight Emmanuel Rodriguez (2-0) of Newark, NJ and lightweight Lester Brown (3-0-1, 1 KO) the Bahamas.